Our versatile aluminium frame system uses modular profiles to build a range of display equipment, such as showcases, cabinets, portable graphic displays and much more. With its extensive range of components, our modular aluminium frame system is flexible enough to realise the 3D design and construction requirements of a vast range of projects. It paves the way for the realisation of original concepts that definitively capture customers’ imaginations. Engineered from extruded aluminium the aluminium frame system comprises of posts and beams that can be interlocked in a multitude of ways: perpendicular, angled, end-to-end and side by side. The integrated C channels on our profiles also allow for the connection of a variety of accessories which include: audio-visual support, literature dispensers and small tables. The core structure is then ready to be dressed with materials as varied as acrylic, glass, wood, metal, fabric, and graphic panels for an arresting finish. It is this spectrum of structural possibility married with cutting-edge materials that provide a remarkable array of shapes and dimensions, which ultimately leads to breathtaking design. 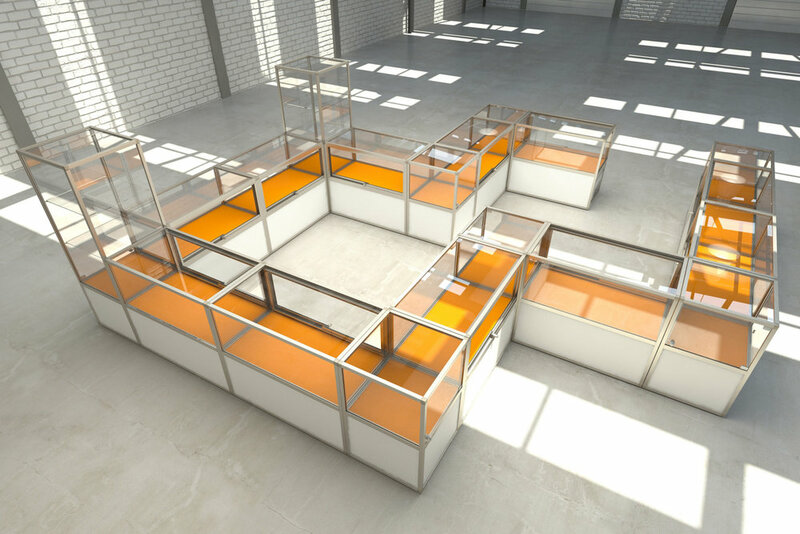 Sol is a modular retail display system that creates exciting, reconfigurable displays which are quick and easy to assemble. Constructed in modular lengths from our aluminium frame system that interconnect to make cube based geometric structures, Sol's elegant and minimalist design is practical and robust. Available based on 350mm and 500mm cubes with a diffrent shelf material options, it is capable of displaying a wide variety of merchandise in a visually appealing and cost-effect way. 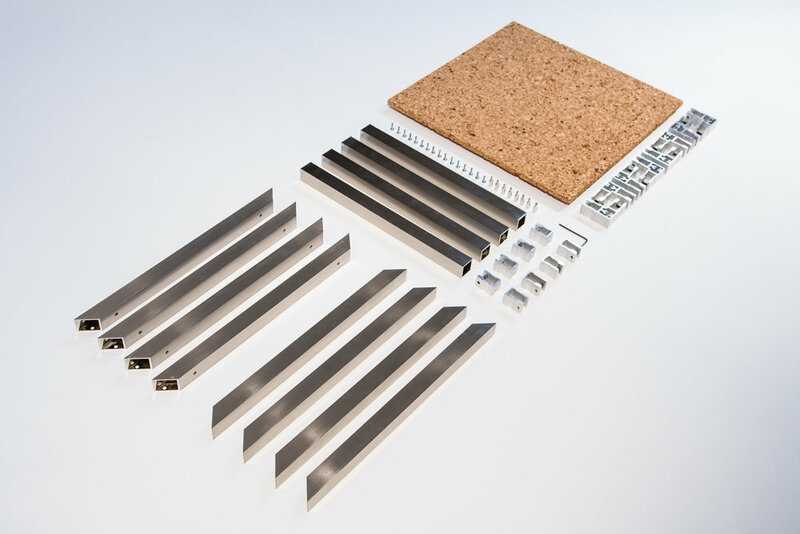 25/25 is a slimline flexible system made up of a 25mm box section aluminium profile and an array of angled and perpendicular connectors. The system can be used to create a multitude of structures. Designed for retail 25/25 can be used in many other commercial interior applications too. Because 25/25 is a lightweight, flat-pack system it offers increased flexibility, whilst still maintaining the rigid, stable and strong functional aspects needed for any shelving system. Our Metro graphic display range is designed to offer incredible flexibility and minimal build-time with portable or static displays, for public and trade projects. Particularly suitable for both receptions as a permanent structure, or for temporary promotional events, graphic displays are a cost-effective way to create instant visual intrigue and appeal. Available in ten preconfigured options, this range provides yet another dimension to our aluminium frame system. Our screens can be customised with accessories that include: poseur tables, literature dispensers, overhead lighting, cable management, carry cases, clip-in slat walls and base plates. With graphics simply fitted by magnetic tape, a 2m x 2.5m display takes as little as fifteen minutes to construct, delivering instant visual impact.